Their weekly CTV series, ‘Nashville North,’ introduced in 1970, became ‘The Ian Tyson Show’ (with Sylvia only an occasional guest) in 1971 and continued until 1975. Ian and Sylvia made their last appearances as a duo in May 1975 at the Horseshoe Tavern in Toronto. They have been reunited on occasion – eg, for a concert filmed 18 Aug 1986 by the CBC at the Kingswood Music Theatre, Maple, Ont, with Lightfoot, Judy Collins, Emmylou Harris, and Murray McLauchlan as guests. 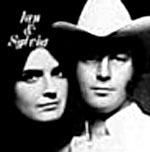 Ian and Sylvia were inducted into the Juno Awards Hall of Fame in 1992.